Beautiful craftsmanship is what you’ll discover when you visit our showroom and marvel at the Landau pontoon boats we have inside. The name “Landau” is synonymous with gold-standard excellence and why Action Marine is proud to be a Landau dealer. 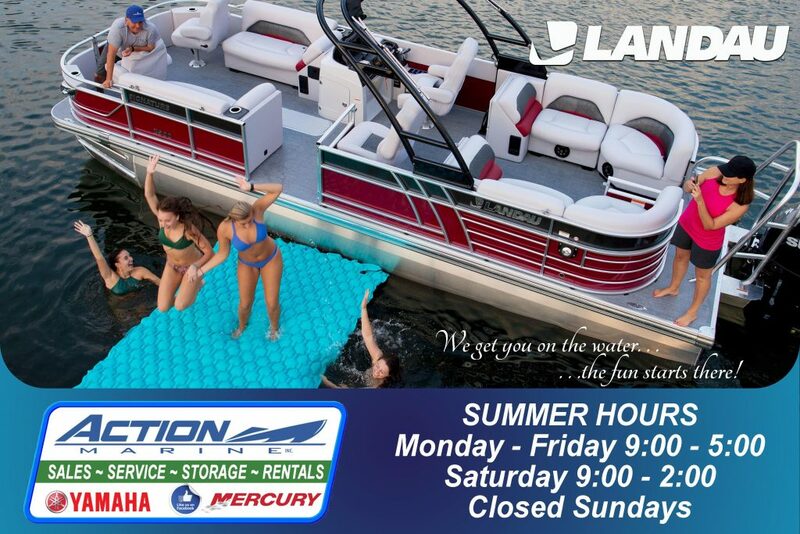 Check out Landau’s commitment to quality (from their seam welded pontoon tubes to the soft vinyl flooring and luxurious seating) and you’ll be boating in a Landau Island Breeze or Atlantis Landau model this summer! Action Marine is offering special 2018 model year incentives. Call or stop in to discuss your new Landau with Keith or Julie today! Freight, pre-delivery, inspection, license, insurance, registration fees and taxes are extra. Photos may show options and accessories not included in the offer. Void where prohibited. Offer may be discontinued without prior notice. See your Action Marine sales representative for the conditions and restrictions of offers and other details. What products we don’t have, we can get typically acquire in a day or two upon request.